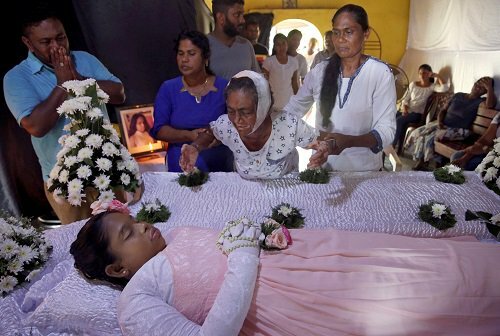 Sri Lankan Martyrs - Intercedite pro nobis! 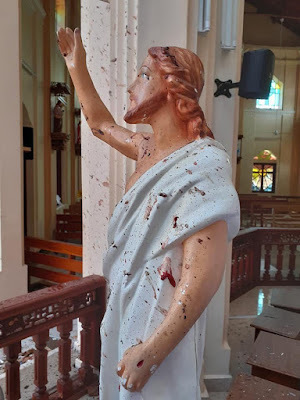 Our Catholic brethren in Sri Lanka are suffering greatly today at the hand of radical Islamists. This is not something we expected to wake up to. (CNN) An ongoing series of bomb blasts struck luxury hotels and churches across Sri Lanka on Sunday. At least 140 people were killed and 560 have been injured in the coordinated terror attacks, which have put the entire country on lock-down. 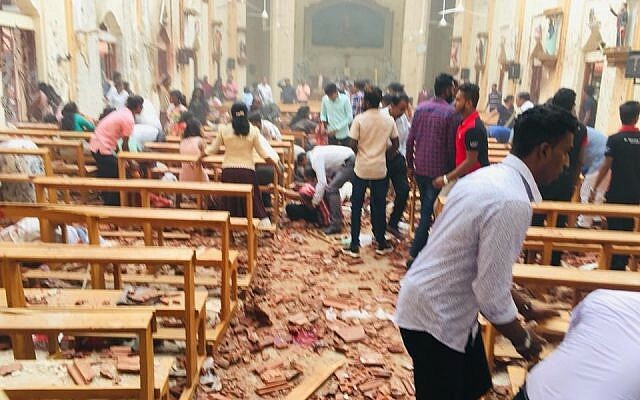 Additional blasts ripped through three high-end hotels, the Shangri La, Cinnamon Grand and Kingsbury Hotel, all in capital city Colombo. In a statement, the Shangri-La hotel in Colombo said that the hotel's Table One cafe was hit just after 9 a.m local time. The hotel is popular with foreign tourists and the country's business community. A seventh and eighth blast, at a hotel in front of the Dehiwala Zoo in Dehiwala-Mount Lavinia and at a private house in Mahawila Gardens, in Dematagoda, occurred Sunday afternoon. 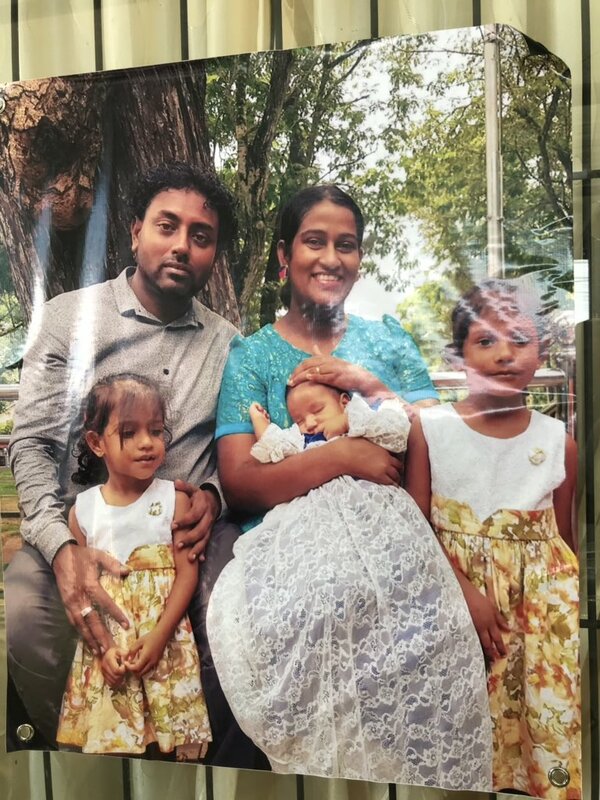 At least 20 foreigners are among the dead in Colombo, according to hospital Director General Anil Jasinghe. Hospitals have opened their doors to scores of victims. #18 CHASTISEMENTS will BEGIN WITH PARIS Prophecy dated December 8, 1874. "In Rome the storm will be the blackest. The storm of Rome is even worse than the storm in France. All the wrath of the ungodly is in Rome. All the anger of the wicked is focused on the Holy See. (But), The chastisements will begin with Paris." The Bishop who investigated her and determined her vision to be of supernatural origin was named, Fournier. The same name as the priest who ran into the burning cathedral to rescue the Blessed Sacrament and Crown of Thorns. The other church in the Holy Card is Basilique du Sacré-Coeur de Montmartre in Paris. Tomás Luis da Victoria, "O Vos Omnes"
It is the birthday today of Papa Joseph Ratzinger. May he have many more. I truly mean that. Many more. Many more so that we can know the truth. Many more so that he can find the courage to speak and to reclaim that which was stolen. When the great announcement came back in 2005, we were gathered at work in the atrium. I work in a Catholic institution and when he came out, I was one of only two of about 50 who punched the fist in the air, "Yes!" Everyone else looked as if they had seen their worst nightmare. I read much of what he wrote. I respected him and admired the man and his mind. When he became Pope, I slept well at night. He gave me and the Catholic faithful back something that was stolen to us by one of his evil predecessor, Montini and only niggardly restored to us by Wojtyla. Then, one day, he made it all about him. A selfish, narcissistic decision that has left us unsettled ever since. 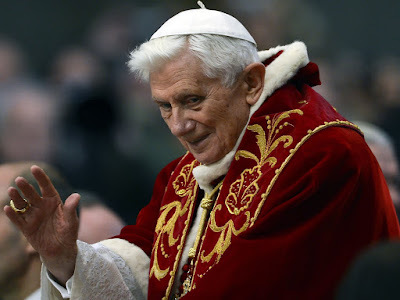 Happy Birthday Pope Benedict XVI. May you live many more years in order to testify to the truth of what happened and take back the throne from which you were pushed. Then, I will say that I am sorry for being angry with you and for not praying enough for you lest you flee from the wolves. The wolves to whom you, in your cowardice, abandoned us. How much worse can it get at St. Joseph's Ottawa, an Oblate Parish. Forty years ago, I lived in Ottawa and was an active parishioner at St. Brigid's and experienced first hand, the Oratorian Affair. It was lead by the heretical and modernist anti-Catholic forces from that parish. It's pastor then was Douglas Crosby, OMI, now the Bishop of Hamilton. He stood by and tolerated the abuse his flock administered on their fellow Catholics. The story of this parish is partially discussed below. 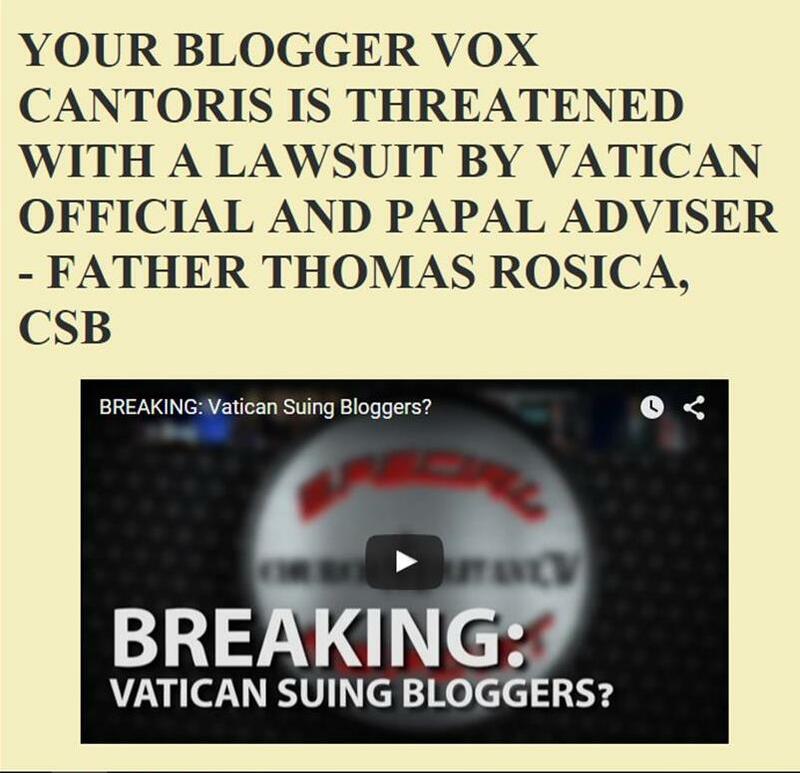 Toronto Catholic Witness Blog has uncovered the latest. It is long past time for Archibishop Terrence Prendergast, S.J. to act to discipline this place. 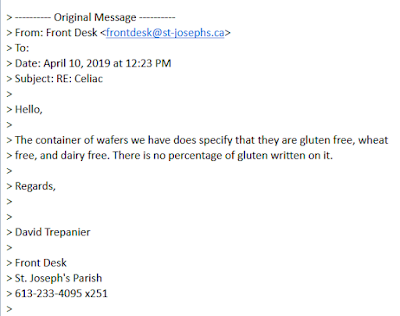 Sacrilege at St. Joseph's Parish in Ottawa: illicit matter is being used for "hosts" for "Mass"
It has been brought to the attention of this blog, that St. Joseph's parish, in Ottawa is using illicit matter for hosts at Mass. 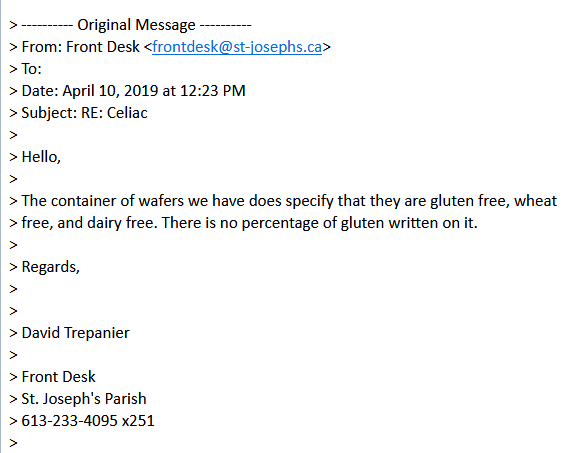 An email (see above) confirms that illicit "wheat free..." wafers are being used for those faithful who suffer from Celiac Disease. The practice at St. Joseph's is to consecrate valid hosts, whilst at the same Mass also simulating the non-consecration of "wheat free..." wafers. 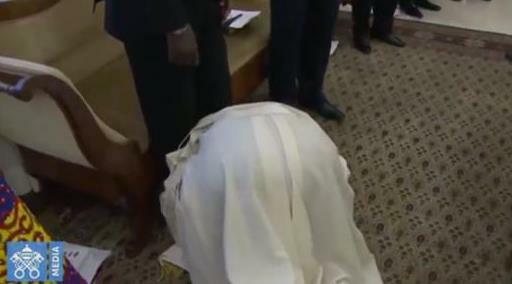 BERGOGLIO OF ROME WHO WILL NOT GENUFLECT TO THE LORD AT MASS GROVELS TO KISS THE FEET OF FOUR SOUTH SUDANESE POLITICIANS! With these words, he lost me again. How wonderful it was to read it, how clear and to the point. Yet, it failed. While there is much good in it and he goes to the heart of a lack of belief in God, he blames the 1960's without addressing the elephant in the room. That sodomites and communists came into the Church to destroy the faith of the people from within. He knew it, he knows it. He abandoned us and yet, he remains the Pope. He is a coward, a bad father for abandoning his children to a rapacious malefactor, a fool, a fraud, a usurper. It is time, Father Ratzinger, long past time for you to come clean. Issue another letter and take back your Throne! We've written previously of this Maradiaga. Edward Pentin of National Catholic Register interviews the author of a new book, Sacred Betrayal, where the writer, the woman referred to in the first link above, delivers a firm rebuke of this pompous, arrogant clericalist and friend and confidant of Bergoglio of Rome. It must be obvious now to everyone that the Catholic Church is in its gravest crisis since the time of Arian. From First Vespers last night until the Paschal Vigil, the Gloria Patri is not said after the Asperges on Passion Sunday or the Prayers at the Foot of the Altar, Introit, Lavabo and Communion Antiphonal Psalms. In the Office, it is eliminated from some of the Verses and Short Responsories. Jesus is losing his earthly glory. The readings and psalm antiphons reflect this in the Mass and Office. Those who hate him are now plentiful, as plentiful now, as when he walked. Those who seek his death are now coming to the fore. Those who seek the death of His Church are coming to the fore and are also within Her. 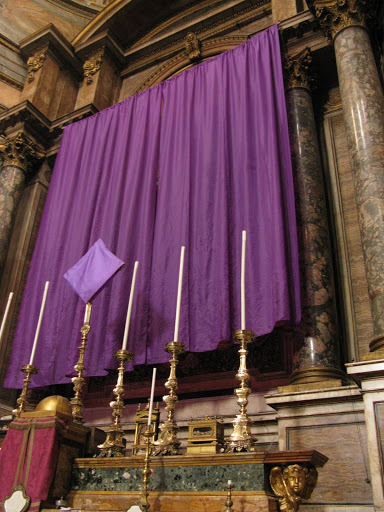 Lent now takes a change in focus; -- while our penance continues, we now shift towards the passion of Our Blessed Lord and his saving work of redemption. "During the preceding four weeks, we have noticed how the malice of Jesus' enemies has been gradually increasing. His very presence irritates them; and it is evident that any little circumstance will suffice to bring the deep and long-nurtured hatred to a head." His passion then has begun. His glory is no longer apparent. There is one element that remains in the modernist liturgy depending on the parish's own tradition. While it was once obligatory it is now optional and that is the veiling of the Crucifix and statues, though not Stations of the Cross or the imagery in windows. The change from the one-year Lectionary, in place from St. Gregory the Great was a grievous error. The desires of the Fathers of the Second Vatican Council could have been achieved without the assault on the whole Church tradition of readings. A Lesson could have been added to the Sunday liturgy. Weekdays could have had their own Mass texts whilst still acknowledging the Sanctoral cycle. Advent could have had its own lectionary as in Lent in the traditional rite, with the Advent readings in the Novus Ordo is about the only good that can be said of it. The three-year Lectionary remains a problem. Mass is not a bible study. For the Mass on the Fifth Sunday according to the Roman Missal of 1962, the Gospel is what it has been for 1600 years and it explains the veiling. GOSPEL ¤ John 8. 46-59 † A continuation of the holy Gospel according to St. John. St. Augustine said that at this moment by virtue of His divine nature, Jesus became literally invisible. 205 God calls Moses from the midst of a bush that burns without being consumed: "I am the God of your father, the God of Abraham, the God of Isaac, and the God of Jacob. "9 God is the God of the fathers, the One who had called and guided the patriarchs in their wanderings. He is the faithful and compassionate God who remembers them and his promises; he comes to free their descendants from slavery. He is the God who, from beyond space and time, can do this and wills to do it, the God who will put his almighty power to work for this plan. Moses said to God, "If I come to the people of Israel and say to them, 'The God of your fathers has sent me to you', and they ask me, 'What is his name?' what shall I say to them?" God said to Moses, "I AM WHO AM." And he said, "Say this to the people of Israel, 'I AM has sent me to you'. . . this is my name for ever, and thus I am to be remembered throughout all generations." CCC 206 In revealing his mysterious name, YHWH ("I AM HE WHO IS", "I AM WHO AM" or "I AM WHO I AM"), God says who he is and by what name he is to be called. This divine name is mysterious just as God is mystery. It is at once a name revealed and something like the refusal of a name, and hence it better expresses God as what he is - infinitely above everything that we can understand or say: he is the "hidden God", his name is ineffable, and he is the God who makes himself close to men. CCC 207 By revealing his name God at the same time reveals his faithfulness which is from everlasting to everlasting, valid for the past ("I am the God of your father"), as for the future ("I will be with you").12 God, who reveals his name as "I AM", reveals himself as the God who is always there, present to his people in order to save them. CCC 208 Faced with God's fascinating and mysterious presence, man discovers his own insignificance. Before the burning bush, Moses takes off his sandals and veils his face in the presence of God's holiness.13 Before the glory of the thrice-holy God, Isaiah cries out: "Woe is me! I am lost; for I am a man of unclean lips. 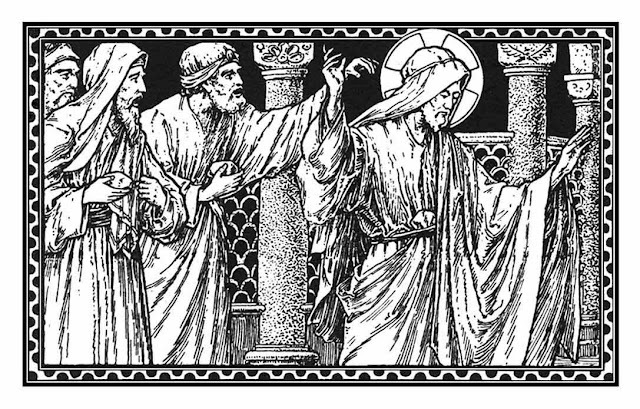 "14 Before the divine signs wrought by Jesus, Peter exclaims: "Depart from me, for I am a sinful man, O Lord. "15 But because God is holy, he can forgive the man who realizes that he is a sinner before him: "I will not execute my fierce anger. . . for I am God and not man, the Holy One in your midst. "16 The apostle John says likewise: "We shall. . . reassure our hearts before him whenever our hearts condemn us; for God is greater than our hearts, and he knows everything." Jesus revealed to the Temple authorities, the leadership of Israel, who He was. He knew Abraham and did so in such a way that they would know with clarity who He was. He hid Himself. Now, he is in hidden in our churches and chapels only to be unveiled when we recall His Crucifixion -- "ecce lignum crucis," -- "Behold the wood of the Cross on which hung the Saviour of the world, come let us adore him." If we hide Him we cannot abide the glory of His saints, therefore, they are also hidden. Christ is shamed. He is humiliated by those whom he came to save. The Jews betrayed Him, we continue to betray Him today. He declared Himself before all Israel to be the I AM of the Burning Bush; and for this, they would kill Him. They knew what He said, they knew what He meant. He confessed to them that he was the very Son of God, the very God Himself come to earth. In the sermon below from 1846 we find an incredible dissertation on Jesus hiding Himself. It is a sermon by an Anglican, but one would be hard-pressed to find a better sermon or homily said today on the subject from a typical Catholic pulpit. This was a period which leads Bl. John-Henry Newman home. Would that we could here preaching like this today. BISHOPS AND OTHER CLERGY OF THE CHURCH. CURATE OF ST. JOHN'S, CHELTENHAM. OXFORD: J. H. PARKER. CAMBRIDGE: T. GREEN. Then took they up stones to cast at Him." Thus are we brought down from the whole Gospel for the day to that portion of it which will engage our chief attention during the brief remainder of this morning's service. "But Jesus hid Himself, and went out of the Temple, going through the midst of them, and so passed by." 1. Jesus "hid Himself," as man, in prudence: according to the will of His Heavenly Father. As He had been born in "the fullness of time," so it was at an appointed hour that He was to die. But "His hour was not yet come ": and He therefore avoided whatever might unduly quicken the course of events, or put forward the grand horologe of time. And this He did in obedience to the Will of His Heavenly Father. This obedience was the mainspring of His conduct throughout His earthly sojourn. "Lo I come to do Thy will, O God," was His motto from first to last; and never was it more fully translated into action than in all He did with regard to His final suffering and departure. When that hour of mingled humiliation and glory, which compressed eternal interests within the compass of a few passing minutes; when that everlasting hour arrived, the holy and obedient Jesus yielded Himself at once into the power of His enemies. Thus, when Satan had entered into Judas Iscariot, Jesus said to the traitor, "What thou doest, do quickly." 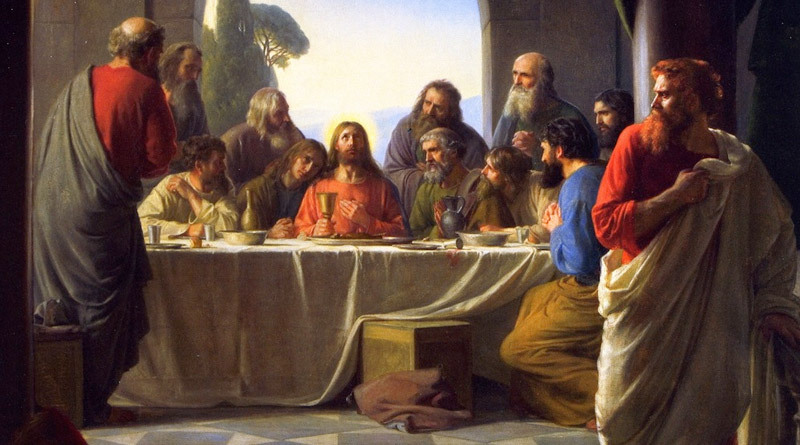 When Judas came to Him in the garden with men and officers from the chief priests and Pharisees, "Jesus, knowing all things that should come upon Him, went forth and said unto them, Whom seek ye? They answered Him, Jesus of Nazareth. Jesus said unto them, I am He." And when the impetuous Peter—the first to defend, the first to deny his Master—drew his sword and cut oft" the right ear of Malchus, the High Priest's servant, "then said Jesus unto him, Put up again thy sword into his place: thinkest thou that I cannot now pray to My Father, and He shall presently give Me more than twelve legions of angels? But how then shall the Scriptures be fulfilled, that thus it must be?" When Pilate would fain have released Him, and sought for some pretext for so doing in the replies of Jesus to his interrogatories, "Jesus gave him no answer." And at the last, when He saw that all was "finished,"—prophecy fulfilled, types realised, the preparations for His sacrificial Death complete, His Father's will wrought out,—He bowed His head, and gave up the ghost." But until the arrival of that hour, His conduct was marked throughout by unexampled prudence. While He wrought His miracles before the multitude, and taught openly in the Temple, and in secret did nothing; while He boldly confuted and reproved the Pharisee, the Sadducee, and the Herodian, regardless of the enmity He thereby incurred; He carefully shunned the precipitation of His end. He had a mission of vast pregnancy and moment to discharge; and until this was done, He would not lay down that life which the Father had put into His power. Whenever danger became imminent, He withdrew Himself from the presence of those who sought to lay hands on Him and destroy Him. Thus, on the occasion immediately before us, when the infuriated Jews took up stones to cast at Him, "Jesus hid Himself, and went out of the Temple, going through the midst of them, and so passed by." Jesus “withdrew Himself from thence." On a subsequent occasion, similar to that of the text, when the Jews again sought to take Him, "he escaped out of their hand, and went away again beyond Jordan." When the Sanhedrim, after the official prophecy of the unconscious Caiaphas, took counsel together to put Him to death, "Jesus walked no more openly among the Jews; but went thence unto a country near to the wilderness, into a city called Ephraim, and there continued with His disciples." Thus, throughout His whole earthly career, our Blessed Lord exercised a prudence of the highest order; enforcing by His own example the precepts He gave to His first disciples: "Be ye wise as serpents, and harmless as doves ;"—" When they persecute you in this city, flee ye into another ." And these precepts, supported by this supreme example, and adapted to the exigencies of Christians at the present day, apply also to us. "As men may not be too tenacious, so neither may they be too profuse and lavish of life and the comforts of it," says Dean Stanhope; "lest, besides their present hardships, they find at last an indiscreet zeal returned, with a 'Who hath required these things at your hands?' Love indeed is apt and desirous to give over-measure, where it can: but still this must not be the effect of passion alone. Prudence should temper and direct it." "It is an office of prudence," says Bishop Taylor, "to serve God So that we may at the same time preserve our lives and our estates, our interest and reputation, for ourselves and our relations, so far as they can consist together. For Christian religion, carrying us to heaven, does it by the ways of a man; and by the body it serves the soul, as by the soul it serves God; and therefore it endeavours to secure the body and its interest, that it may continue the opportunities of a crown, and prolong the stage in which we are to run for the mighty prize of our salvation; and this is that part of prudence which is the defensative and guard of a Christian in the time of persecution: and it hath in it much of duty." Thus far we have endeavoured to consider the conduct of our Blessed Lord, on the occasion under review, on its human side; as an exhibition of prudence and discretion. But it has a sublimer aspect than this; to which we now with reverence will turn. Jesus “hid Himself," as God, in majesty; the majesty of displeasure. "He did not hide Himself," says St. Augustine, "in a corner of the Temple, as if He were afraid; or take refuge in a house, or run behind a wall, or a pillar; but, by His heavenly power making Himself invisible to His enemies, He went through the midst of them." Just before, He had said, "Before Abraham was I Am"; with evident reference to the Name revealed by the Lord to Moses, as recorded in the First Lesson for this morning's service; when He appeared to him in the burning but unconsumed bush, as he was keeping the flock of Jethro, the Priest of Midian, near the base of Mount Horeb. On that occasion, when Moses would have drawn nigh to see that great sight, the Lord forbad his nearer approach, and commanded him to unsandal his feet, because they were standing on holy ground. He, who required this reverence towards an inferior manifestation of Himself, would not permit the rude hand of violence to invade His incarnate glory. He "hid Himself" in the secret depths of His invisible Godhead. There is, doubtless, a mystery in this; and we cannot fully understand why He, who submitted on so many occasions to endure the contradiction of sinners against Himself, refused on other occasions to undergo the indignities that wicked hands would have put upon Him. But a like mystery invested the whole of His earthly career. The darkest shades of humiliation were never permitted altogether to obscure His glory; while yet, that glory was so far hidden, that men despised Him and esteemed Him not. Great, however, as was the mystery of His commingling of glory and shame, the mystery of the manifestation of His glory alone was greater. He might have flashed forth devouring lightnings from the dark and surcharged cloud. He might have kindled into supernatural and overwhelming brightness the splendours of His Divine and resistless Presence. But He did none of these things. He manifested forth His glory by hiding Himself. When the Lord, in the days of old, would preserve righteous Lot and His prophet Elisha from the hand of violence, He smote their enemies with blindness; and so He might have done on this occasion: but, as the threatened indignity was greater, so was the punishment wherewith He visited it. "He hid Himself." Awful are the exhibitions of Divine glory, when the Lord is raised up out of His holy habitation, and comes forth from His unseen depths to punish the ungodly. But these are as nothing when compared with the hidings of His face. When the Lord would denounce the severest judgments against Israel of old, He said to Moses, "Mine anger shall be kindled against them in that day, and I will forsake them, and I will hide My face from them, and they shall be devoured, and many evils and troubles shall befall them; so that they will say in that day, Are not these evils come upon us, because our God is not among us?" And when, on the other hand, He would confer upon His repentant people the greatest possible blessing, He said by the mouth of Ezekiel, "Neither will I hide My face from them any more: for I have poured out My Spirit upon the house of Israel." The hidings of Jesus, in the days of His flesh, were yet more majestic and awful. He came into the world for the express purpose, among others, of manifesting the glory and the grace of God: so that to hide Himself was, as it were, to revoke His mission with regard to those from whom He thus withdrew. He abandoned them to the evil of their own hardened and unbelieving hearts, and left them to be filled with their own ways. It is impossible to conceive anything more dreadful than the condition of the man from whom Jesus has hid Himself. Such a man sinks at once into a state of moral stupidity: he sins on without aim or purpose. Until Jesus hid Himself, the unbelieving Jews had an object against which to direct their malignant attacks; but when He could be no longer seen, their malice, though as virulent as ever, became wholly impotent and senseless. 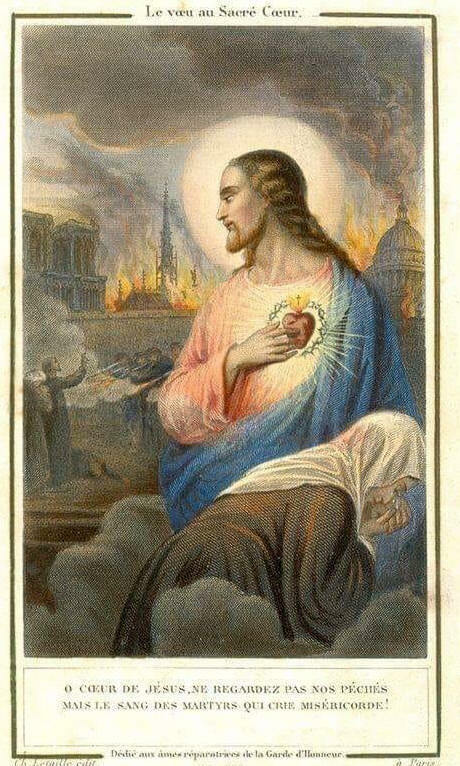 And so, when Jesus hides Himself from sinners of the present day,—who insult His majesty because it is concealed to the-eye of sense or mere reason (though not to the eye of faith), beneath mean and simple accidents,—He leaves them to perish as brute beasts. The force of argument and moral suasion having been tried upon them in vain, together with all other manifestations of the true and holy Jesus, He will no longer expose Himself to the rash temerity and blinded insolence of their invasions, but hides Himself, going through the midst of them, and so passes by. The abstract contemplation of such a subject is too awful for man to dwell upon at any length; and we will therefore now consider it, (so hastening to a conclusion,) under its practical aspects and bearings. But is it possible, men may ask, for persons at the present day to commit acts of insult and injury towards the Divine Jesus, akin to that of the blaspheming Jews when they took up stones to cast at Him? Alas, it is but too possible. "Certainly we cannot commit such open blasphemy; but it is another matter whether we cannot commit as great. For, often sins are greater, which are less startling; insults more bitter, which are not so loud; and evils deeper, which are more subtle." 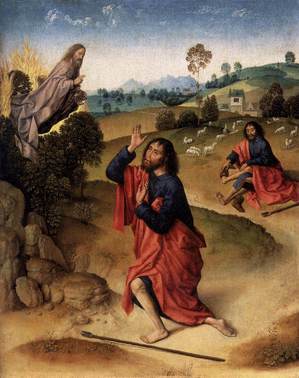 Although Christ is no longer on earth in bodily presence, He is here by His Spirit: and it is quite possible for men to repeat the offence of the blaspheming Jews by casting stones, so to speak, against either the Church, which is His Body; or the Sacraments, which are His Presence; or the Poor, who are His Brethren. The Church is the Body of Christ, "the fullness of Him That filleth all in all:" and they who resist or blaspheme or persecute Her, do in effect resist and blaspheme and persecute Him. And such are not only, nor even chiefly, the openly wicked and profane; whose offences are of a different description: but those who deny the Divine authority of the Church, rejecting her principles for the opinions of men and the maxims of the world; those who deny her Apostolicity, treating her as a merely human and secular institution; those who invade her constitution, legislating for her on grounds of political expediency, and not according to the laws of Christ. "Verily, I say unto you, they have their reward." They refuse to acknowledge the Body of Christ in His corporate members; and He hides it from them. They are no longer permitted to behold the tokens of her presence. She becomes to them what they would have her be. In their eyes she has no form nor comeliness, although she is all-glorious within. But with these hidings of her beauty and this withdrawal of her presence, there comes not only an apparent abdication of her authority; leaving men to live as they list, according to the broad measures of the world, instead of the straight and narrow lines of eternity: but also the utter loss of her intercession and benediction. She no longer stands between the living and the dead. A silent curse spreads over the land she has abandoned to itself. The rulers have forsaken Christ, and Christ has forsaken them. The people would have it so, and their house is left unto them desolate. Be learned, ye that judges of the earth. If His wrath be kindled, yea but a little. Again, the Sacraments are the Presence of Christ. In the Sacrament of Holy Baptism, He is present by His Spirit, Who, in answer to the prayers of the congregation, is given by our Heavenly Father to infants, when baptized, that they may be born again and be made heirs of everlasting salvation. In the Sacrament of the Holy Eucharist, He is really and spiritually present, being taken and received by the faithful as their heavenly food and divine life. Whoever, therefore, despises the Sacraments, despises Christ. Whoever denies their saving power, denies the Presence of the Saviour in them. Whoever in effect casts stones at these, as by cavils or contumely or neglect, does in reality thus cast stones at Christ. And then does the Son of God hide Himself from them in the majesty of displeasure; and Sacraments become to these persons what, in their rationalistic unbelief, they would have them be. Baptism, when administered by schismatics and pretenders to Holy Orders, fails to regenerate; and their own theory, that Baptism admits only to an outward union with a nominal church, is, in their own case, verified. The Communion is reduced to a formal commemoration of an absent Saviour. In both cases, as regards their own mere outward show of Sacraments, they are right. They have taken up stones to cast at the spiritually-present Jesus; and He has hidden Himself, going through the midst of them, and so passing by. Lastly: the Poor are the Brethren of Jesus. They are so even in respect of their mere poverty; although it must not be concealed that the poor man who is a wilful sinner is severed from this communion and fellowship. But he, who is at once poor in this world and poor in spirit, is united by the closest bonds to the lowly Son of Mary. This is strikingly shown in the parable of the Sheep and the Goats, wherein the Judge declares that whatsoever is done unto the least of the Hungry, the Thirsty, the Stranger, the Naked, the Sick, the Imprisoned,—being "the poor of this world," but " rich in faith and heirs of the Kingdom," —is done unto Himself. Now, we all know how apt men are to "despise the poor." "There are kinds of distress founded on the passions, which, if not applauded, are at least admired in their excess, as implying a peculiar refinement of sensibility in the mind of the sufferer. Embellished by taste, and wrought by the magic of genius into innumerable forms, they turn grief into a luxury, and draw from the eyes of millions delicious tears. But no muse ever ventured to adorn the distresses of poverty or the sorrows of hunger. Disgusting taste and delicacy, and presenting nothing pleasing to the imagination, they are mere misery in all its nakedness and deformity." And therefore the many "despise the Poor." But in so doing, they despise Christ; and what is their punishment in consequence? Jesus might rend aside the veil of His humanity, and reveal Himself as God. He might put off the sordid dress of poverty, and clothe Himself with light as with a garment. But He inflicts a severer punishment than this—He hides Himself. The Poor no longer visibly bear upon them "the marks of the Lord Jesus "; and secular legislation, at once blind and self-confident, sets itself to relieve their distress by increasing their degradation. It brands the Poor Man as a Pauper, and consigns him to contempt and shame. Jesus has hidden Himself in majestic displeasure: and men of the world little dream that He will reveal Himself again at the Last Day, and avenge the cause of the poor and the oppressed! "Oh, how much are they to be pitied, in whatever sphere they move, who live to themselves, unmindful of the coming of their Lord. When He shall come, and shall not keep silence; when a fire shall devour before Him, and it shall be very tempestuous round about Him; every thing, it is true, will combine to fill them with consternation: yet, methinks, neither the voice of the Archangel, nor the trump of God, nor the dissolution of the elements, nor the face of the Judge itself, from which the heavens will flee away, will be so dismaying and terrible to these men as the sight of the poor members of Christ; whom, having spurned and neglected in the days of their humiliation, they will then behold with amazement united to their Lord, covered with His glory, and seated on His throne! How will they be astonished to see them surrounded with so much majesty! How will they cast down their eyes in their presence! How will they curse that gold, which will then eat their flesh as with fire, and that avarice, that indolence, that voluptuousness, which will entitle them to so much misery! You will then learn that the imitation of Christ is the only wisdom: you will then be convinced it is better to be endeared to the cottage than admired in the palace; when to have wiped the tears of the afflicted, and inherited the prayers of the widow and the fatherless, shall be found a richer patrimony than the favour of princes."